1/2 Barrel planter made from a 5 gallon barrel with a handmade raised wrought iron sta..
Used wine or whiskey 1/2 barrel planter with a decorative handmade wrought iron stand. Perfect for t..
Used wine or whiskey barrel planter. Perfect for the garden or indoors. Select from four sizes: D.. Serve in style with this barrel serving cart. Hand crafted by the Thousand Oaks Barrel Co., this car.. This barrel serving stand is made from a reclaimed bourbon barrel. Holds six bottles of wine, whiske..
Barrel Stave Console & 2 Pub Stools Set (p/n 17719). Beautiful, functional and authentic, ..
Wine bottles come in different shapes and style so if this is not perfectly balanced the customer ca.. This bourbon barrel ice chest is made from a real bourbon barrel. Fill it with ice and beer and get ..
After years of imparting French oak nuances to fine American wines, the barrel in our half-barrel bo..
Half Barrel Bottle Rack (P/N 17448). Hand-made in the USA from reclained oak wine barrels, the..
Half Barrel Bottle Racks Triple Stack (P/N 17449). Hand-made in the USA from reclained oak win..
Beautiful hand crafted Barrel End Table with wrought iron stand. Made from a real 5 gallon barrel si.. Handsome fine handcrafted Old World table boasts an abundance of character and charm. Crafted from s.. This very functional fine handcrafted table has lots of character and charm. Table base is construct..
Beautiful hand crafted Quarter Barrel Table with wrought iron stand. Table top size is 21". 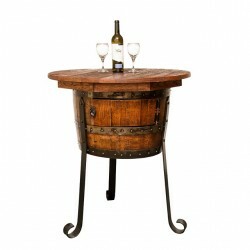 ..
Beautiful hand crafted Quarter Barrel Table with wrought iron stand. Table top size is 21" ..
Quarter Barrel Pet Feeder. Now your special friend can eat in style. Whether a gentle nibbler or guz.. Stave and Hoop Coffee Table combines staves and wine barrel hoops to create a fantastic dimensional .. Stave and Hoop End Table Made from the staves of the barrel and the wine barrel hoops create a fanta..
Table Top Barrel Wine Rack will complete any room. Made from a real barrel, the rack holds 10 bottle..
That's Right! A whiskey barrel Bar-B-Que pit. .. This one of a kind beauty is crafted from a retired barrel that is converted into a cabinet. Cabinet.. These chairs are hand made from French Oak Wine Barrels. We sand and route the edges then stain it w..